Delhi Chief Minister Arvind Kejriwal on Tuesday took on to Twitter to launch a scathing attack on Prime Minister Narendra Modi saying the latter made his mother stand in queue for currency exchange at the bank for political gains. PM Modi’s mother Heeraben Modi had come to exchange her old currency notes at a bank in Gandhinagar, Gujarat. 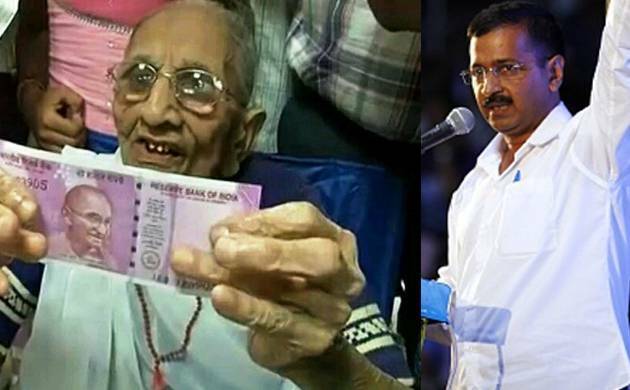 Kejriwal said that Modi did not do right by letting his mother stand in queue for politics. He also said that if it was his mother, he would himself stand in the queue and not let her do so. Earlier on Tuesday, Kejriwal moved a resolution in the Delhi assembly urging President Pranab Mukherjee to direct the Narendra Modi government to withdraw the decision to scrap the currency notes of Rs 500 and Rs 1000.